I am contacting you in your capacity as White House Advisor on Violence Against Women, and the continuing refusal of the US Department of State to implement their own guidelines and US federal law in regards to defending the rights of American victims of domestic abuse living abroad, involved in foreign judicial proceedings. For the past 8 years I have been informing the American Embassy & Consulate in Madrid, as well as the State Department in Washington, DC of the repeated violation of my rights by my lawyers in Spain (2007-2012). Additionally, I have continually informed them of the refusal of appropriate Spanish authorities to investigate my allegations against implicated lawyers (2012-present, see attached translated letter to Defensor del Pueblo). I have repeatedly solicited Consular assistance under the Convention of Consular Relations, and US federal law, to no avail. Not only do I have a compelling case against the Spanish government under international law, but against the American government as well. The cover-up of domestic abuse and silencing of victims by judicial actors in Spain is well documented by Amnesty International, Save the Children, and more recently CEDAW in Gonzalez Carreño vs. Spain, 2014. Additionally, the rampant corruption in Spain was condemned by Ambassador Solomont in a press conference in 2013. The American Embassy and American government cannot feign ignorance to rampant corruption and discrimination against women in Spanish courts, as well as the almost certainty that American women & children victims of domestic abuse will NOT be protected. It is therefore, under the reasonable person principle, ABSOLUTELY necessary for the American Consulates in Spain to assure the protection of victim’s rights within the courts. The refusal of the American government to act (omission of action), creates a tort under their obligation to protect, under international law. As a ‘human rights of women’ lawyer, you are obviously familiar with the obligation of governments to take positive action in ending violence, oppression, and discrimination against women. The US Department of State (and all its agents) have a clear legal obligation, as well as the legal tools at their disposition, to defend and protest the violation of rights of their citizens in foreign courts. Their refusal to utilize the legal tools at their disposition demonstrates the American government’s continuing bad faith, and lack of conviction in fulfilling their international obligation to combat violence against women, combat domestic violence, and combat discrimination against and oppression of women & children. These baseless argumentations are the type of gobbled-gook I have been receiving in official communications from Spanish & American civil servants for the past 8 years, and which I challenge and dismantle in my blogs on Womenalia, Huffington Post, and my VAW/DV as a Human Rights Violation presentation at the 11th Annual Battered Mothers Custody Conference. Additionally, I will strenuously be challenging these contentions in presentation of my case to CEDAW (Wilcox vs. Spain), if appropriate action is not immediately forthcoming from the American Embassy/Consulate in Madrid, and/or Spanish authorities. I sincerely hope that American government officials, in the White House and State Department, will start reading my correspondences, instead of relegating official communications to civil servants who are totally ignorant about US federal law, international law, and lack basic common sense. Just because the US government is basing its policies, particularly foreign policies, on ignorance, misinformation, and prejudices, civil servants & elected officials are not absolved of wrong-doing. Public authorities have a legal obligation to be properly informed about the issues with which they deal, and ignorance of the law, or the facts of the situation, does not absolve them from their legal responsibility. Human rights law of the past 60 years has firmly established that gross human rights violations can in no way, shape or form be defended under ‘habitual custom’ or ‘those were my orders’ argumentation of xenophobic and/or sociopathic public authorities. However, even though a well-orchestrated extremist, Right-wing backlash in the past 50+ years has created a situation which is equivalent to governments letting the Klu Klux Klan dictate ‘racial-equality’, or the Nazi-Gestapo groups formulating a Jewish ‘solution,’ governments are NOT absolved of the responsibility. For this reason, governments ARE RESPONSIBLE & LIABLE for the discriminatory norms amongst public officials and court officials; norms which have thrived, flourished, and grown within the courts and the political arena. While feminists have been, and are, very vocal about the ‘Stalled Revolution,’ and how it is preventing them from attaining the same level of power & wealth of men, they are failing to understand that as long as ‘breaking the glass ceiling’ remains their only objective, discrimination & oppression of women by the courts will continue to be their greatest enemy and foe. The role of governments, in assuring appropriate application and implementation of laws within their court, is indisputable. In my particular case, the repeated refusal of the Colegio de Abogados de Madrid to adhere to Spanish law in the investigation of allegations against implicated lawyers is in gross violation of Spanish, as well as international, law. And, the refusal of the American Embassy to protest to the Colegio de Abogados de Madrid refusal to act is also in gross violation of US federal law and international law. However, my case is no longer just about the Spanish and American government’s failure to fulfill their obligation to protect, but about assuring that the 7+ million Americans residing abroad are afforded Consular assistance, when requested, as is their right under the law. International divorces and custody disputes are on the rise, and until the discriminatory-trends in the courts (which are also on the rise) are successfully challenged, the refusal of Consulates to take ‘positive action’ – invoking their authority under the Convention of Consular Relations – renders US federal government employees complicit to human rights violations of Americans abroad, in case after case. And, as long as the US State Department continues to refuse to implement their own guidelines and US federal law, I will continue to challenge their right to refuse assistance to Americans living abroad (see my Family Courts in Crisis newsletter – Oct. ‘13) – as well as continue to solicit the assistance of the media in exposing the illegality of US government’s actions, and omission of actions. Further aggravating the American government’s tort (and financial liability) in my particular case, is that my company, Global Expats, is designed to assist expatriated families during their stance abroad, as well as provide remunerated employment opportunities to thousands of ‘trailing spouses’ across the globe. The misappropriation of funds, and my inability to freely access my assets in Spain since July 2007 (with my lawyer’s negligence (see attached table) directly responsible for that inability), has prevented me from moving forward in developing Global Expats in the interim years. Please see timeline of events. Under the reasonable person principle, if I am thrown into abject poverty, obligated to seek refuge in another country, and struggling with permanent housing & stable employment issues, my financial resources for developing a global Internet start-up company would be non-existent. Therefore, logically, lawyers responsible for violation of my economic rights, & my inability to access my rightful assets, are directly responsible for preventing me from moving forward in developing my project. All lawyers, at all times, have been informed as to the existence of my company, and my ex-husbands efforts to destroy it, as well as my necessity for common property funds in order to develop it – their continual refusal to accord me access to my property (financial records) renders them accessories to fraud and racketeering. My lawyer’s efforts to silence me, and my protests to the repeated & continual violation of my rights, has resulted in the loss of hundreds of millions in revenues to my company, and the prevention of thousands of jobs for expatriated women, in addition to loss of all my personal assets (est. $3 million). Not only does the negligence of my lawyers have implications under Spanish penal law, and international human rights law, but also under international commerce law – with their conspiracy to defraud & conspiracy to cover-up penal offenses & human rights violations ongoing offenses – making mute any statute of limitation argumentation on their part. I have continually indicated in all of my official correspondence with Spanish and American officials that my greatest desire is to return to Spain and my children, build my company and live in peace and freedom of movement, as is my rights. I have also stipulated the need for implicated judicial actors to be held accountable for their actions, and omission of actions in all matters. Until those responsible are held accountable, I will continue to pursue all legal channels at my disposition. I wish to note here that in my blogs & elsewhere, I am pursuing argumentation of ‘crimes against humanity’ by governments who are complicit (by their omission of action) to the corruption within their courts, further dismantling any statute of limitation argumentation on their part. 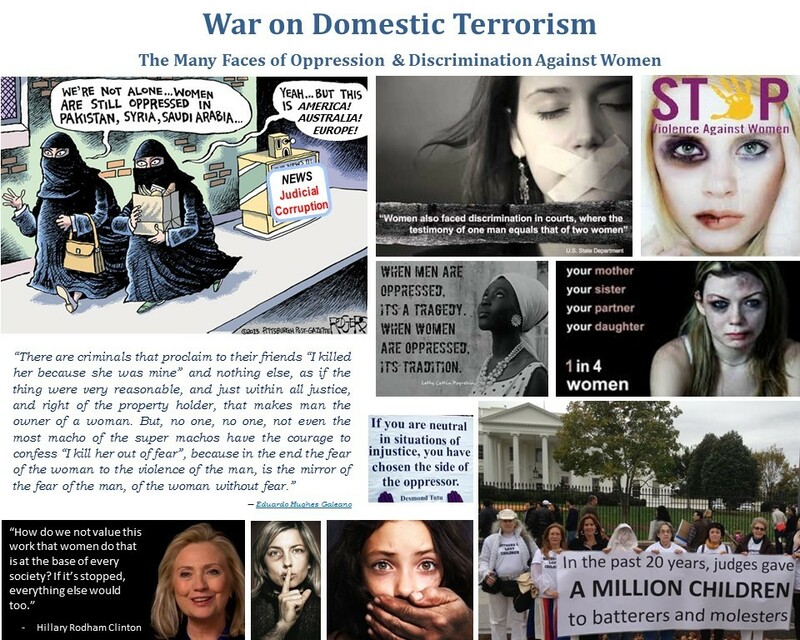 The fact that the White House and the Advisor on Violence Against Women is well aware of the many problems women victims within the courts is evidenced by Lynn Rosenthal’s participation in the Battered Mothers Custody Conference in Washington, DC in May 2013. And, the fact that the White House is well aware of the problems within the courts, but refuses to take ‘positive action’ when they have both the power and authority to do so, as state earlier, implicates US civil servants in human rights violations and crimes against humanity, by their omission of action. As stated and re-stated before (but not sinking into the heads of government officials), and re-iterated in my presentation at the BMCC this year, what is at issue here are court systems which are so riffed with gender-bias and stereo-typing that discrimination has become integrated and ingrained in the reasoning and deliberation of judicial actors and politicians alike. This is why the obligation of appropriate public authorities to hold judicial actors accountable, to the letter of the law, is primordial in assuring that governments fulfill their obligation to protect. The complete and total laissez-faire policy of the executive and legislative branches towards the judicial branch defies all rules of democracy & democratic procedure – striking down any ‘judicial independence,’ ‘sovereignty,’ or ‘private rights’ defenses put forward by ignorant and misinformed civil servants. While my citation of international conventions and jurisprudence in family courts is admittedly new and innovative, all my argumentation is well substantiated by UN reports Indepth Study on VAW, Good Practices in Eliminating & Combating VAW as well as scholarly literature such as The Human Rights of Women and Gender Stereo-typing: Transnational Legal Perspective by Rebecca Cook, inter alia (see my bibliography). The continuing contention of US and Spanish civil servants that my argumentation & official solicitations for assistance are nothing more than “illusions of a stupid housewife” are testaments to their ignorance, lack of training, lack of competence, lack of cognitive ability, etc. The elevated ignorance & discriminatory norms of government officials and civil servants is in and of itself a human rights violation, as well as criminal negligence & malpractice. As long as the State Department insists on continuing with discriminatory norms, and refuses to utilize federal and international law to protect and defend the rights and interests of American women and children residing abroad, I will be propelled to continue challenging the State Department’s & Obama Administration’s perpetual inaction in federal and/or international courts. I hope that by bringing the aforementioned issues to the attention of the White House, the Obama Administration will examine and reverse its discriminatory policies, and cease and desist in its collaboration with the systematic oppression of women & children in the USA as well as countries around the world.